Sajid Javid, the Business Secretary, has asked Luxembourg's EU minister to arrange a meeting of the EU Council so he can ask permission to use taxpayers' money to try and prop up the tattered remains of the UK's steel industry. 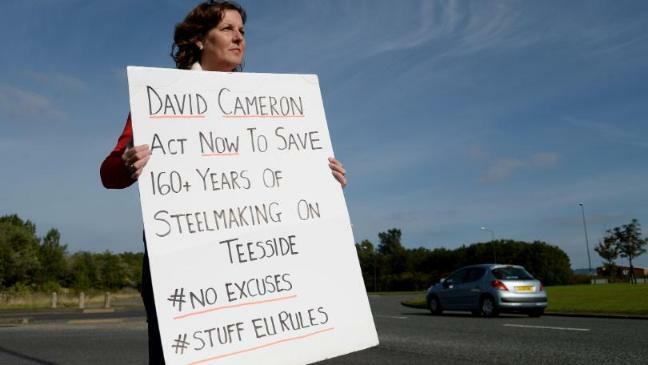 Steel plants in Redcar, Scunthorpe, Motherwell and Cambuslang have been closed in recent weeks with thousands of job losses at the plants themselves and many more to come as the effects are felt down the supply chain. Reasons cited for the closures include cheap imports, high energy prices and green taxes which are all down to EU policy and regulations. If we weren't in the EU the British government could offer incentives or reduce taxes to keep the plants viable. But because we're in the EU it would be classed as illegal state aid so the British government has to beg the EU for permission to try and save thousands of jobs.